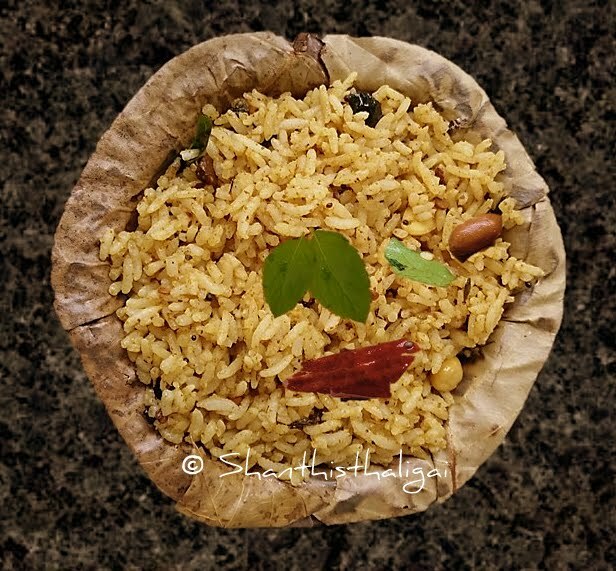 This is another easy to make Iyengar special spicy rice, with the flavour of mustard seeds and tamarind, offered to God on the month of margazhi. Mustard seeds - 2 tsp. Mustard seeds - 1/8 tsp. Chenna dal - 1/2 tsp. Soak tamarind in lukewarm water for 5 minutes and grind all the items given in "for the paste" with little water to a paste. Cook rice in such a way that the grains are separate and not sticky. Spread the cooked rice in a plate and add a spoon of fresh gingelly oil and allow it to cool a bit. In a kadai, heat gingelly oil and temper the ingredients mentioned in "to temper" until they turn golden brown. Keep aside. In the same kadai, heat oil add the ground paste and saute in medium heat until the raw smell is diffused. When oil leaves the sides, add cooked rice, ghee, required salt and mix well without breaking the grains. Add the tempering to the rice and mix gently. Alternatively, you can add the cooked paste, ghee and temperings to the cooked rice also. Iyengar special kadugorai is ready. Serve with fried papads or appalam or vadaam of your choice.